The KB1 is a complete, personal sound system designed for musicians who want an all-in-one, easily portable PA package. 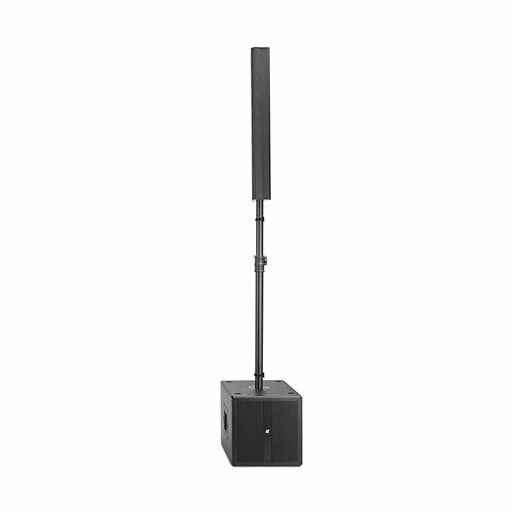 Applications for this product include acoustic performers, music and speech reinforcement, a portable AV, stage monitoring, front fill if doubled-up, as a main stereo system for all types of events. The system is a PA solution that features a line array top for high frequencies and a 12” subwoofer for the lower frequencies, a built-in 4-channel mixer, and multi effects with 16 presets engine built-in. The K-framework managing software allows you to control the system from your computer. You can control the system’s capabilities such as parametric EQs, dynamic compressors and routing, and configure it as your main PA as well as your stage monitor system.